When we talk about “drive programs” we are talking about the specialized software that controls the computer within every drive and makes it do what it’s supposed to do. Each manufacturer and most every model has its own custom package of software that makes it useful for the intended application. Some drives are beautifully simple to program. Others, like the Siemens Masterdrive series, have over three thousand changeable parameters. If a drive program freezes, hangs up, gets corrupted, or the memory battery dies, your drive will quit working. Much like a home computer it needs to be shut down and rebooted. “Rebooting” a drive involves defaulting and re-entering the parameters. This is a relatively simple operation when entering them off a list, downloading them off a laptop, or if your application is rather simple. It can be a difficult, time consuming, and expensive task if a complex program has to be re-engineered from scratch. 1.When selecting a new or replacement drive, be sure to verify that all necessary parameters are available. Failure to do so can result in the need to purchase additional equipment or a completely different drive. Make sure that you have documentation of your drive’s parameter settings. Parameter information can often be obtained from the original equipment manufacturer. At the very least, we suggest taking the time to copy them to an electronic or paper backup. Keep in mind having Ideal Service document parameters is much cheaper than having to start from scratch. To Bypass or not to Bypass…That is the Question/Unless the Question is…WHAT IS BYPASS? 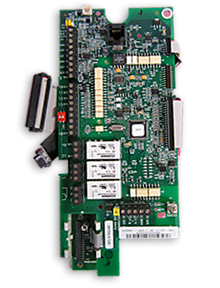 Bypass is a back-up system used in some drive applications that enables a motor to be run “across the line” without the drive but at a fixed speed through a motor starter/motor overload assembly. (AC motor speed is determined by the frequency). So just what is bypass good for? Bypass is most common in HVAC applications where failure of a fan, pump or cooling tower can cause considerable distress in the affected areas, and requires immediate correction. Most of these applications are variable torque meaning that the load is multiplied logarithmically with the speed and are generally easier to start than linearly loaded constant torque applications. While efficiency suffers when running in bypass, most hvac systems will adjust to one element being “out of control”. Below is a list of conditions incompatible with bypass. 1. Drive runs in torque mode. 3. Drive must match speed of a related process. 6. AC power available is insufficient to start load across line. 7. Process control starts/stops exceed duty cycle starts of equipment. 8. This process can be down for a day or two while it is being repaired. 9. My budget won’t allow it. In the end, bypass is a temporary fix while you get your drive repaired, its value is directly proportional to the amount of screaming people on your back when something goes down. Please do not hesitate to give us a call if you have questions or concerns in any drive/bypass situation. We look forward to hearing from you. Better process control is the whole reason drives exist. From manufacturing to HVAC, a drive is one of the greatest inventions since the simple on/off switch. A drive can give you control over processes that have constantly changing variables–as long as you can measure the variables. Let us use a simple but common illustration. Many golf courses have irrigation systems with multiple zones controlled by only by timers. However, each zone will have different characteristics such as length of pipe, numbers and types of heads, and require different volumes of water to maintain pressure. Proper constant pressure assures total coverage of the correct amount of water. Each zone will require a different drive speed to maintain design pressure. By adding a pressure sensor to a drive, we can set the desired pressure or any process variable that we choose and let the system do the workMost modern drives have built in PI and sometimes D (Proportional, Integral and Derivative) software built into the processor. This PID software can often be found drinking coffee and eating donuts just waiting to be used. PID just needs a few pieces of information to become active and effective (PID details below). As always Ideal Service is here to assist you with better utilizing your drive systems in order to save money and achieve greater performance. PID loops are one of the most often overlooked drive capabilities that you’ve likely already paid for–it just needs a sensor and a little programming assistance an you can be on your way. **PID Details Below (Caution: Reading the information below may cause a headache) Necessary bits of PID information include: choosing an analog input (Ex: AI2) as your process feedback, feedback type–current or voltage (Ex: 0-10V), feedback sensor range (Ex: 0-100psi), and your desired setpoint (Ex: 50psi). With this information the drive “knows” to increase speed if AI2 drops below 5 volts and to decrease speed if AI2 goes beyond 5 volts. A drive system that smoothly glides up to the desired setpoint and stabilizes is what P and I are all about. Proportional gain is a multiplier of the difference between setpoint (5 volts) and process feedback (output of sensor). If the multiplier is low, response to an error signal (setpoint and feedback not equal) is small. If the multiplier is too high, overshoot or oscillations may occur. Note that an error is required for change, zero error X multiplier=0. Integration is about time–how long does it take to change the drive output by the amount of error signal. The time is constant, a larger error changes more in a given time period than a smaller error. The closer you get to your setpoint the lower the gain of the error–overshoot and oscillation are greatly reduced. In spite of the wide variability of drives and applications the process for adjusting PI is basically the same. Add enough P-gain to make the system a little too responsive, use I-time to smooth it out and control overshoot. Stop the drive and seehow it responds at start up. Repeat until desired results are achieved, Enjoy! Almost every request for a service call includes the question of how quickly we can be en route. Often this question is surrounded by a description of the level of urgency. Here are some examples of common statements. We’ve been working on this all week. We’ve already replaced this and that and it still does not work. We have got to be running by tomorrow. We greatly appreciate however and whenever a given customer chooses to utilize our services. However, a quick phone call to Ideal Service can often speed up the process of getting a system back up and running. Giving us a call for support does not obligate you to have us on-site, send in your drive, or pay for our expertise. Let us help take some of the guesswork out of troubleshooting. If we cannot help, we’ll try to point you in the right direction. I have a drive that trips off every once in a while, but will start up again if reset or restarted. How do I make it stop doing that? A: Intermittent problems are quite common and often difficult to fix. We often joke with people and tell them their job is to finish breaking it! In reality you do have a role in helping your Ideal Service technician find the problem by paying attention to and recording the specifics of displayed information like faults and alarms, time of day, ambient conditions, noises, time in operation, and anything like “it happens when…” Every contributing factor is a clue that helps us find and eliminate those annoying intermittent problems! Wye in the Delta do I need to know anything more about my input power than the voltage? Its all about voltage to ground (PE) and input noise filtration. Most every drive today utilizes capacitors and/or MOVs or something similar to dissipate voltage spikes present on incoming power, and some include filtration for electromagnetic noise radiation. They are all designed with more modern transformer wiring configurations in mind. If you have a wye configuration feeding a drive no steps need be taken for any of the manufacturers drives we have encountered. If you have a delta connection consult the manual for directions or call Ideal service for help. You can determine your power transformer configuration by looking at its name plate or by comparing the AC voltage to ground of each phase. If they are all equal you have a wye configuration. Why do we at IDEAL make such a big deal about cleaning fans and drive heat sink’s? The equation is this: R= e -t/MTBF . Everyone eyes glaze over when you say that Reliability equals emissivity to the negative power of temperature divided by the Mean Time Between Failures. In real world terms there is an exponential relationship between how long electronic parts last and their temperatures. Big deal you say? Consider the common capacitor—every drive has them. They are commonly rated at 2000 hours at full voltage and either 85C (185F) or 105C (221F). Two thousand hours is only 83 1/3 days. Most drives last more than 3 months. That is mostly because they don’t run at maximum temperatures and voltages. The cooler they run, the longer they should last. (MTBF is more like an average than a guarantee) Note: Ideal service uses only 105C rated caps whenever they are available for our repairs even if the OEM only uses 85C parts. Another reason is the fans themselves. Fans are commonly rated at around thirty thousand hours, a mere 3 1/2 years of continuous use. And that’s lab conditions–no dirt, dust, insects, spider webs, nuts, bolts, grease, water, oil, cement, soot, mice, snakes, chicken feed or sewage to gum it up and slow it down. Fans are going to fail—let us help you stay on top of them to prevent a cascading failure, one small failure leading to multiple larger problems. My drive says FU on the display–should I be offended? No need to be offended, it’s just something lost in the translation. This is the open bus fuse indication on a Yaskawa G3 series drive. On the next generation of drives the indication was changed to PUF–which is an apt description of what has happened. Any drive, Yaskawa or not, that has a DC bus fuse that is open has other damage. Replacing the fuse and applying power will just cause more damage and waste another fuse. I replaced an older motor on an Air Handler and now my drive is getting overload faults. Is the drive bad too? No, it’s a matter of efficiency and slip. Newer motors have a higher base speed than older ones to reflect the changes in energy efficiency requirements. If your old motor was rated at 1725 rpm and your new one is 1770 rpm you are spinning your fan faster at full speed, (45 rpm/gear ratio). Centrifugal loads increase at cube of the speed so small increases in speed take a disproportionate power increase. Generally the FLA rating for an equivalent horsepower is also higher–don’t forget to update the motor data in the drive! Quite often the only solution of this problem is to limit the max speed at the drive to reflect the maximum current draw of the motor or drive whichever is lower. My DC drive will occasionally clear the fuses–even when lightly loaded, everything checks ok and new fuses restore operation. What causes that? The most common problem with these symptoms is brush dust or other contamination inside the motor. It can be diagnosed by looking at and around the commutator for pitting or arc marks from flash over.